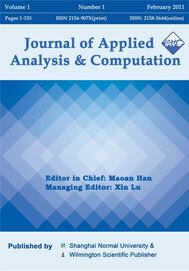 The Journal of Applied Analysis and Computation (JAAC) is aimed to publish original research papers and survey articles on the theory, scientific computation and application of nonlinear analysis, differential equations and dynamical systems including interdisciplinary research topics on dynamics of mathematical models arising from major areas of science and engineering. The journal is published quarterly in February, April, June, August, October and December by Shanghai Normal University and Wilmington Scientific Publisher, and issued by Shanghai Normal University. JAAC is indexed in SCIE with Impact Factor 1.063 (2017).